Above: This is a sample diagram of a mind map of The Grammar of The Analytical Lexicon of The Apostolic Bible Polyglot. The Grammar of The Analytical Lexicon of The Apostolic Bible Polyglot is not a Greek grammar in the typical sense which one would find being used in a Greek language class. This grammar is specifically designed to be used with the Analytical Lexicon of The Apostolic Bible Polyglot. As can be seen by going through the grammar there are no paradigms or lists which one is expected to memorize of inflections of various words. The Analytical Lexicon itself offers this information in each line. It is the intent of this grammar to explain and expand on the various structures one will find within Analytical Lexicon of The Apostolic Bible Polyglot. A video Pronunciation Guide is available on the website apostolicbible.com which follows the “true Greek” pronunciation used in Greece rather than the invented or “Erasmian” Greek developed during the 16th century in western Europe. We hope that rather than set Mount Everest before the student and tell him to climb it, instead he finds a gradual path that leads to the summit, with an enjoyable walk, and a exhilaration of being able to understand God’s purpose in writing His Holy Word. 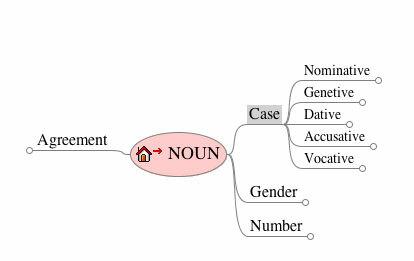 Above: This is a sample diagram of an unexpanded FreeMind mode..
To be able to see and navigate the grammar you will need both the FreeMind software module and The Grammar of The Analytical Lexicon mindmap files (.mm). To go to the FreeMind site and download the FreeMind module click HERE. Next select either the .zip files for a PC HERE or the .dmg file for your Mac HERE both of which contain the files (.mm) for the mind maps of the grammar. 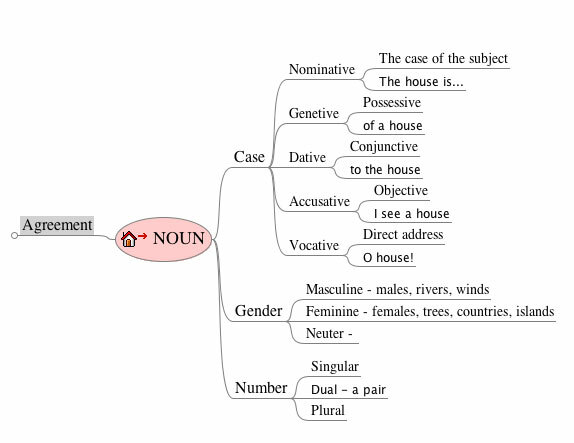 The mind maps have a .mm suffix and if you keep them all in the "Grammar" directory then they are easy to use. The FreeMind application needs to be opened first. Once FreeMind is open then go to "file open" and choose the “parts of speech.mm” first...this node will lead you to the other mind maps. All of these sample diagams are static (just a picture), but once FreeMind is loaded then they expand, shrink, and link to other nodes all by the touch of the cursor. FreeMind has a great help file system and you should shortly be navigating the grammar with ease...maybe even adding your own nodes with information you have gleaned elsewhere concerning Greek grammar. Above: This is a sample diagram of a semi-expanded FreeMind mode.. The parts of speech in the mind map correspond with the parts of speech in The Analytical Lexicon of The Apostolic Bible Polyglot and can be studied as needed. Above: This is a sample diagram of an expanded FreeMind mode.. This grammar is in its infancy and all things are possible. Hopefully we can all learn and share new experiences which can be added to the mind maps and nodes of the grammar, so your input is most welcome.